Every day, there are military spouses who find their way. They learned how to recognize their strengths, and feel more confident as a result. They got clarity about what they really wanted and then learned how to design their ideal lifestyle around it. Most importantly, they realized that they didn’t have to take the journey alone. You matter. You’re already working hard every day; why not make sure your footsteps are leading you in the direction of your dreams. You don’t have to face military life alone. It’s time to manage your inner critic so you can get into action. With sincere empathy, a supportive style, and an enthusiastic commitment to turn difficult times into opportunities for personal growth, I can help you refocus, take action, and achieve results! Progress is easier when you have a goal worth working towards. You’re more likely to reach your goal even faster if you take the time to figure out which strategies have worked for you in the past while finding new strategies that align with your own personal style and accelerate your progress. I can help you identify good strategies that can be replicated again and again, create a sense of personal accomplishment, and set you up for success. We can always benefit from the objective perspective of someone who has our best interest at the top of their agenda. Collaborating with a coach who understands the military lifestyle first-hand will help you find solutions for your most pressing concerns. 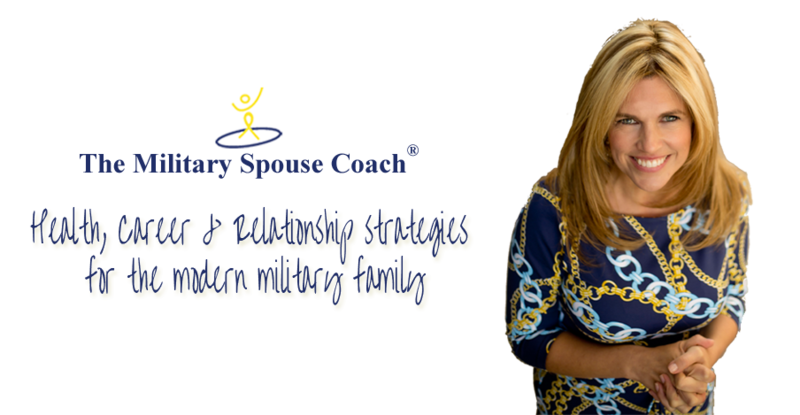 As the Military Spouse Coach, I will help you identify the knowledge, skills, and abilities you need to achieve your goals, help you address any obstacles you encounter along the way, and help you build momentum and stay motivated.